From the first glimpse, trying to understand the contents of the gemmological certificate might seem like a highly complex task. However, once we know what stands behind those words and figures, the whole process appears much easier. When buying an item of jewellery, it makes sense to spend some time studying the accompanying gemmological certificate. This is the only way you can make sure that the diamond is worth its stated value and that the price is just for the diamond jewellery piece you are planning to purchase. In this article we will review the main details concerning reading and interpreting the contents of a gemmological certificate. As an example, we shall look at the EGL issued certificate. This certificate is only one of many recognized gemmological certificates currently issued in different countries of the world. These certificates can differ in design but they all contain pretty much the same information. The certificate in our example consists of seven sections. Each section contains the following information. 1) The first section in the gemmological certificate tells us the most important information. This is an equivalent of a passport for the diamond. The main properties of the diamond that affect its value are described here. From reading the first section, you can learn whether the diamond is of a natural origin or if it is laboratory created or artificially enhanced. Also, here you can learn about its cutting style (shape), colour, clarity grade and, which is the most important, the cut grade of the diamond. 2) The second section reveals the additional information about the diamond. The features presented here are considered to be of a lesser importance and, therefore, they have less significance for the value of the diamond. Such features include the size, the finish (polish), the symmetry and the fluorescence of the gemstone. 3) The third section identifies whether the diamond is "a conflict" one (not applicable in our example) together with its cut grade category (in our example it is <excellent, ideal>, which is the highest possible category for a diamond cut grade). 4) The fourth section of the certificate familiarizes us with the "inner characteristics" of the diamond which enables us to gain understanding about its inclusions noticeable at 10 X magnification. If the specified level of magnification does not make the inclusion noticeable, the certificate will not list it. 5) The fifth section is the diagram of the diamond proportions. If we look carefully, we can see some percentage figure stated under the diagram. In our case the figure is 100%. It tells us the ratio. The diamond in our example has the ideal proportions. Typically, it means that such diamond is of a very high brilliance. 6) The sixth section shows us an image portraying the light reflection degree of the diamond (on the left). The light reflected by the diamond has three components to it which are all represented in the picture. It is important to know that this image tells us about the brilliance ability of the diamond. The red mark in each light component column means that this diamond has an excellent degree of light reflection, in other words, it sparkles very intensely. 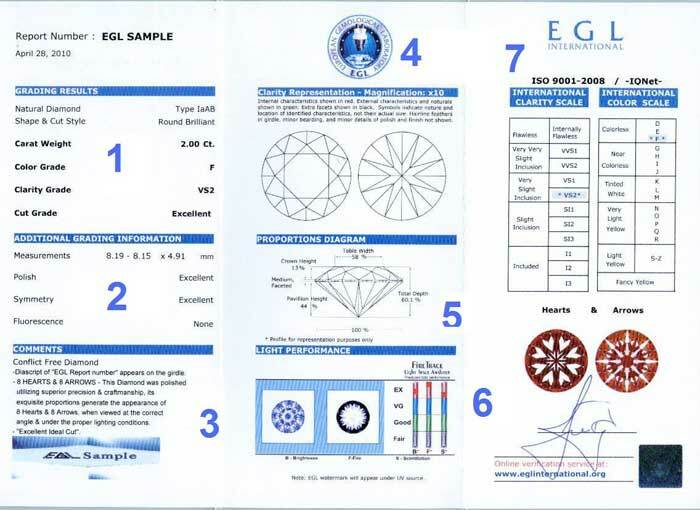 7) The seventh section of the gemmological certificate contains the table with colour and clarity grade scales. This table allows us to see the degree, to which the properties of a particular diamond in your jewellery item are matched or mismatched with the properties of another diamond in the same jewellery piece, for example. Here you can also gain an understanding of the information from the first section, such as VS2 clarity grade and F colour grade.